With so much eating, drinking, and writing on the horizon for the next two weeks, it's hard to imagine wanting to bite off (sorry) another assignment just days after returning from Belgium and days before embarking on the wild journey that will be Philly Beer Week #5. But when a Cilurzo (Russian River), a Grossman (Sierra Nevada), and a Morin (beerbistro) conspire with a one Mr. Tom Peters at Monk's Café for a memorable beer dinner, well, it's just tough to say no. There are not enough superlatives to describe last night's dinner at Monk's Café in Philadelphia. Russian River and Sierra Nevada Brewing Companies from northern California sent their top honchos in advance of Philly Beer Week to put on a dinner show of epic proportions. They each brought their wives as well. To match the beer in the kitchen, Monk's brought in Brian Morin, a veteran of many Monk's Café dinners, from Toronto's famed beerbistro. Let's get the menu out of the way up front this time. Grossman and Cilurzo both led off the evening with comments regarding their deep love and appreciation for Philadelphia and its beer scene. They aren't sticking around for Philly Beer Week this time around, but when their friend, Peters, wants to include their beer in a dinner a few days prior to PBW, they made sure to clear their calendars. The evening turned out to be quite the who's-who of beer in Philadelphia. It seemed as if half the crowd (both the front and back rooms, including barstools, were seated for this dinner) was a recognizable face from brewers to distributors to reps. It was a great chance to catch up with everyone, particularly just prior to the impending PBW madness. Philly's own Beer Lass, and Allagash representative, Suzanne Woods tweeted something to the effect of "am I the only person not at tonight's dinner at Monk's?" Some combination of Cilurzo, Grossman, and Peters introduced almost every pairing of the extravagant 9-course meal. The most interesting stories on the beer side of the table involved the Russian River Row 2/Hill 56 Simcoe as Cilurzo described the brewery's deepening ties to the hop farmers (in this case those that source his Simcoe hops from one of the three Yakima Valley farms that source all of the world's Simcoe), the Symposium Brown, and of course the collaborative Brux. Cilurzo talked a bit about how the Symposium Brown came together for the 2011 Craft Brewers Conference with Ken Grossman (yeast), Brian (recipe), Fritz Maytag (barrels), and himself ("shepherd") each playing their respective role in crafting this fine sour beer with no fruit involved. The new Brux is one of the more talked-about beers of 2012 if, as Grossman explained, for no other reason than getting the "old man (his father, Ken) to relent after 32 years of trying to keep Brettanomyces out of the brewery". 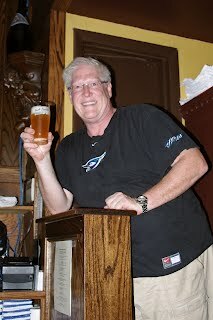 This was the first commercial pouring of the beer outside the northern California brewery walls. Originally code-named Global Warming, this beer was born in Brian (and Gina) Grossman's kitchen, for father's fear at the time of introducing a wild yeast into the brewery operations. For my palate, the beer is a refreshing sour, not overly bracing, and displays lemon citrus flavors. The funk registers fairly low and it should be a beer that is interesting to follow as it ages in the bottle. It will be distributed through the Sierra Nevada network, though availability is promised to be extremely thin even in the Philadelphia market. 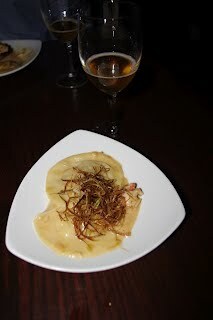 As for the food, the success of the kitchen on this particular night seemed to grow upon itself course after course. 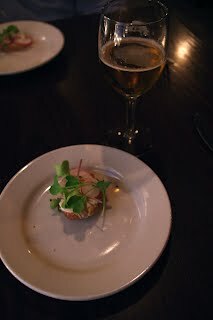 Morin began with a pleasing amuse bouche of radishes and goat cheese and moved into a delectable hunk of smoked, black cod. As well done as these first two bites were, the execution of some of the following courses — namely the steak, ravioli, duck, and chocolate tart — were delivered as perfectly as the words on the menu suggested they would be. There's nothing more disappointing than having high hopes after initially reading a menu be crushed when the fork hits the mouth. Not on this night. How about those pairings, right? Morin had the chance to sit down with the beers ahead of time in Toronto to give himself the best chance for success in building the menu. In this guy's book, he scored the most points with the Brux and papaya slaw under the black cod, the Simcoe beer with the mushroom ragout on the steak plate, the Supplication and duck breasts with sour cherries, and (you could've guessed) the Knock on Wood and chocolate tart. Special thanks to dining companion, Keith, for reminding me of Supplication and duck playing nicely together over five years ago at Monk's. Strong memory, this one has! The Knock on Wood, since I haven't described it until this point (and hadn't even heard of such a beer until the dinner), is basically SN's Hellraiser beer, a chipotle/chocolate stout aged for 16 months in Heaven Hill barrels. Any hint of pepper had basically yielded to the barrel-aging effects and scored one last winning note on a menu full of tasty treats. Yet, after all the superlatives, no amount of insults is greater than the ones that I'm boomeranging at myself this morning for one of the worst displays of inferior, offensive, and amateur pictures from the dinner. I suppose it proves that you can give a big boy a big camera, but that it guarantees nothing. To be fair, I was up for Beer Writer of the Year, not photographer. Still, I've included a few of the pictures that I snapped from the dinner, even (regrettfully) the well-composed one of Grossman, Peters, Cilurzo, and Morin. The only way I could make it halfway presentable for you was to turn it to black-and-white. It's a crowded world of beer events around Philadelphia. Always has been and has only continued get more so over the years. 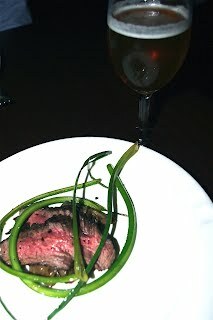 Still, if you've not treated yourself to a special beer dinner at Monk's Café, then you've not yet experienced some of the best that the Philadelphia beer scene has to offer. Philly Beer Week. It's on.